A massive oil spill on May 19, due to the rupture of a privately owned crude oil pipeline in Santa Barbara County, California, has caused many sea creatures in that area to be in dire need of rescue assistance. On Thursday, a SeaWorld rescue team saved a sea lion who had been pulled from the Pacific Ocean, covered in oil. The animal was brought back to SeaWorld's Oiled Wildlife Care Center and treated. Workers said the sea lion was extremely lethargic and emaciated, suffering from anemia and dehydration. Estimated to be a male, between one and four-years old, it is one of many animals affected by the thousands of gallons of oil flowing from the underground pipeline spill. 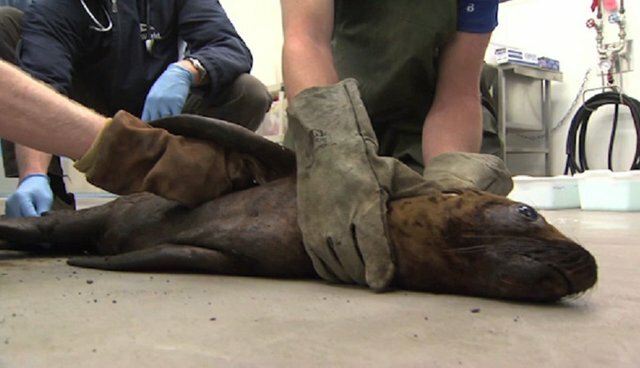 Reports indicate that oil covered 50 percentof the sea lion's body. At first, care specialists and veterinarians were cautiously optimistic about his chances for survival, but have reported today that his fever is gone and he is responding well to fluids. It is also being reported that two more sea lions and an elephant seal were due to arrive at the Care Center Friday evening. Of the spill, Santa Barbara County Supervisor Doreen Farr said, "This is just a disaster. We are taking it very seriously." Environmentalists, while participating in the hard job of cleaning up the animals and the area, hope that it will increase opposition to plans for new drilling in the Santa Barbara Channel. Ironically, this spill occurred just days after a federal agency approved Shell Oil's plan for drilling in the Arctic. The Obama administration is still considering opening the Atlantic to exploration, to the chagrin of many Americans vehemently opposed to both ideas. The Care Center, when not activated for oil spill response, is used to care for ill or injured animals in SeaWorld's rescue and rehabilitation program and for overflow animal quarantine for illegally imported animals confiscated at the US-Mexico border. More than 105,000 gallons of oil spilled on a nine-mile stretch of beach. The State of Californiaclosed two state beaches, Refugio State Beach, and El Capitan near Goleta, and Governor Brown has declared a state of emergency. According to government sources, both beaches will remain closed until further notice. Camping reservations in those areas have been cancelled through June 4; those who have paid in advance will be provided a full refund through Reserve America. They can call 1-800-444-7275 to locate alternative campgrounds nearby.